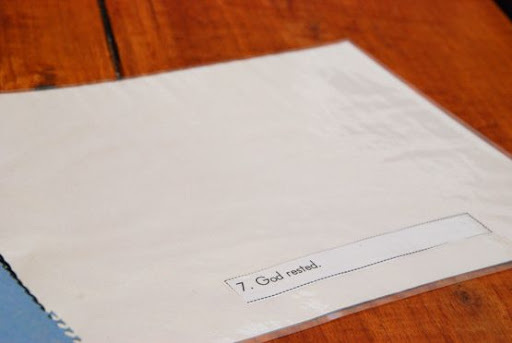 I haven't shared much with you yet about what we've been working on in our little homeschool. You saw some of it in the video I made of our first day of school, but we've done so much since then! So, today, I thought I'd share one of my favorite projects that we've completed so far. We are using a Kindergarten curriculum called My Father's World. I am loving it so far, and so are the boys. It is a very gentle Kindergarten curriculum - full of crafts (which stretches me quite a bit) and hands on activities and suggestions for things to do outside to reinforce what we're learning. It is excellent for my itchy, squirmy, very-short-attention-span boys. I supplement it with additional worksheets for Jack - who is 5 - while Max (3 1/2) does more coloring and playing with manipulatives while Jack works on his worksheets. 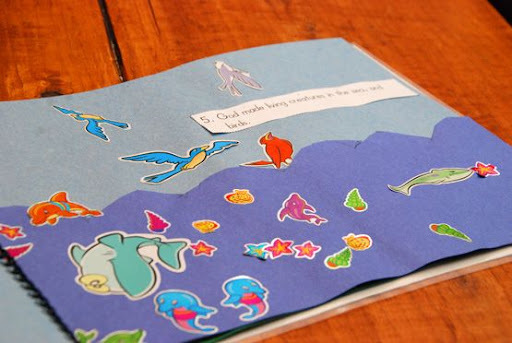 During our first two weeks of school, we focused solely on the Creation story. I loved doing this unit with them. I don't know that I could have told you what God did on each day of creation strictly from memory before we finished this unit, but now, all three of us love pointing out what God did on what day when we're out and about. 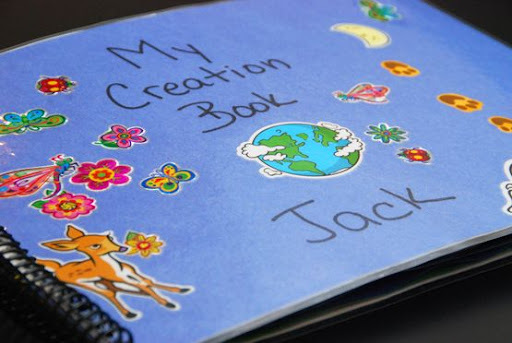 During this unit, both of my boys made Creation Books. I absolutely love how they turned out. The boys still look at them almost every day during our school time, and I am so thankful that we have these mementos of our first two weeks of school together. We worked on one page each day of our unit, and then used three days to review everything we had learned. 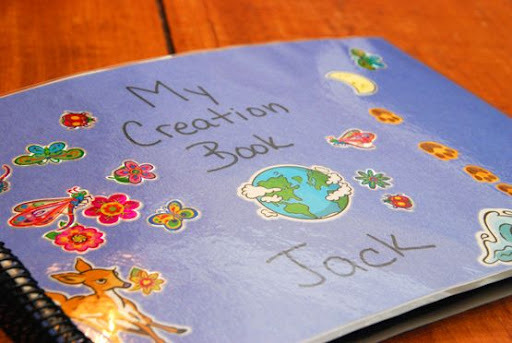 Here is a picture-by-picture look at Jack's finished Creation Book. The front cover. He decorated this himself with stickers. He would want you to know that the deer on the bottom left is eating a flower. The cover is laminated so it would be sturdy. 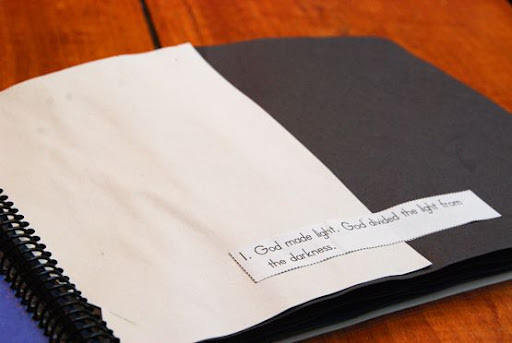 Day 1: God made light. God divided the darkness from the light. If you remember from our video, we went to the ice cream shoppe and had vanilla and chocolate ice cream to celebrate our first day of school and to reinforce the "darkness and light" lesson. That was such a special day for us. Day 2: God made the sky. God divided the water above and below the sky. 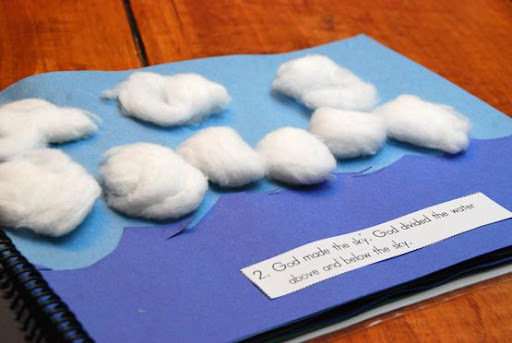 We used puffy cotton balls for clouds. Day 3: God made seas, dry land, and plants. 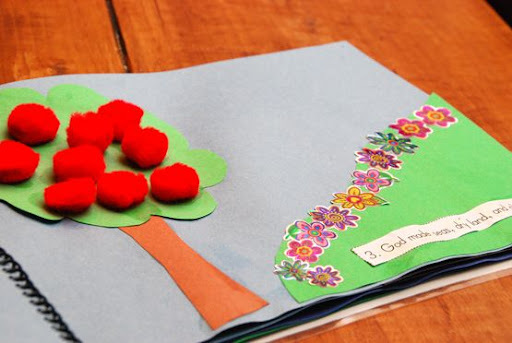 Jack made an apple tree using red pom-poms. And, He worked so meticulously to line up his flowers just right. 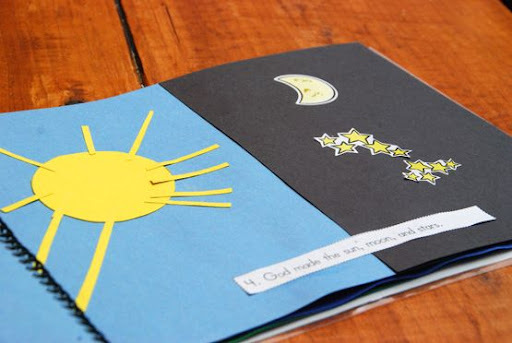 Day 4: God made the sun, moon, and stars. Jack would tell you that God also made the Death Star. I am becoming proficient at using Star Wars analogies when attempting to teach them various concepts. Hey, you gotta just go with what works. Day 5: God made living creatures in the sea, and birds. More stickers. I had stickers from a Veggie Tales sticker book (more on that in a minute), and also some stickers from the dollar bins at Target. I loved the variety of colors and fish and birds when I found them and so did the boys. Day 6: God made animals and other living creatures on the land. God made man and woman. My husband and I will never forget this day. The boys and I, again, used the Veggie Tales sticker book. Well, the "man and woman" in the boys' Creation Books are Bob and Larry. The boys would simply not have it any other way. I allowed it, only to realize after the fact that I had probably just committed the greatest Christian homeschooling debacle of all time. Day 7: God rested. This is the last page. I also had this page laminated, as it's the end of the book and wanted it to hold up. In honor of this day, we all took looooong naps. I think this was the first time I got both Jack and Max to nap without any resistance at all. 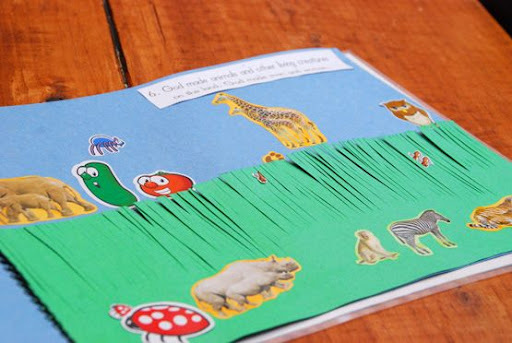 When the boys finished their books, we went to Staples and had the first and last pages laminated, as I mentioned earlier, and also had their books spiral bound. They were so proud walking out of Staples with their books. The boys loved this project. I loved this project. I loved working on it with them. I loved seeing this story of God's love for us and our planet come to life for them in such a tangible and beautiful way. And, I love, love, love that we will forever have these books by which to remember our first two weeks of school together. Sarah, those are awesome!!! They have good reason to be proud. Well done boys (and Mom)! Teaching your boys looks like it is going to be so rewarding for you! Lots of wonderful memories! 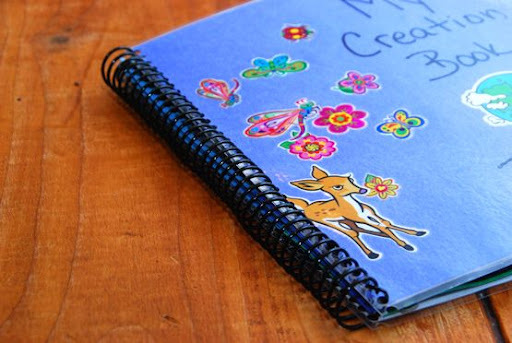 wonderful Sarah, they are beautiful....my kiddies still get out their creation books....such heirlooms and memories! I LOVE THE VEGGIE TALE STICKERS!!! Keep on keeping on.....so many memories still to come...enjoy!!! Love yoU! Those are great! They remind me of my childhood and the creation book I made! My son loved making his, too, last year. I may take it and get it laminated and bound. Great idea! what a fun way to start your school together experience. it's great to see all three of you having so much fun. continue to enjoy the journey. Bob and Larry...hee hee...it took me a minute. 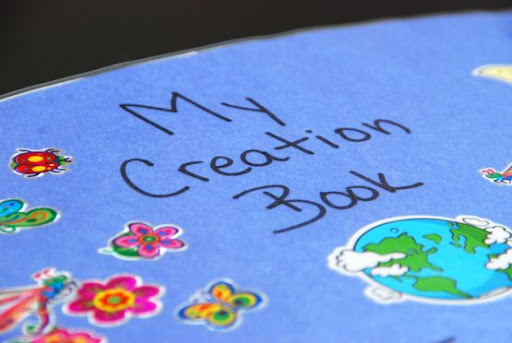 I lovew your creation books and love that you love teaching your kids. "I allowed it, only to realize after the fact that I had probably just committed the greatest Christian homeschooling debacle of all time. " Very awesome project, SS. Thanks for sharing it. those books turned out great. what a great reminder of your first weeks of school. it looks like you are having a great time with homeschooling.